All of this is just so embarrassing for the Knicks, who for whatever reason just can’t seem to have a boring, dignified losing season like so many other teams. Oh no, this has to turn into open discord between their best player and the man running the shots, as a series of leaks have revealed that the Knicks have tried to move Carmelo Anthony to the Cavaliers in exchange for Kevin Love—and were rebuffed. You can say a lot of things about the Knicks, but not that they’re ever off-brand. ESPN reports that the Knicks approached Cleveland about an Anthony-for-Love deal, and were prepared to try to convince Melo to waive his no-trade clause —one of only three full NTCs in the NBA, along with Dirk Nowitzki and LeBron James—if the Cavs were interested. They were not interested. Why would they be? Love was a big part of the Cavaliers’ title last year and has been even better this season. He’s four years younger than Melo. And Anthony does not offer what LeBron is so publicly demanding—a big man and a backup point guard to take the weight off of Kyrie Irving. Reportedly, Cleveland was willing to make this exact deal a year ago, but Melo supposedly wasn’t willing to waive his no-trade clause. Things have obviously changed on both fronts, but what hasn’t changed is that Phil Jackson very clearly would like to move Melo. Two weeks ago, longtime Jackson friend Charley Rosen wrote that “Carmelo Anthony has outlived his usefulness in New York.” People who would know these things believe that Rosen serves as a mouthpiece for Jackson, and was doing so here. Melo read the tea leaves, and held a meeting with Jackson, at which the possibility of seeking trades was reportedly raised. From Melo’s telling, it wasn’t a fruitful meeting. Earlier Wednesday, Anthony said his recent meeting with Jackson and Knicks general manager Steve Mills lasted only five to seven minutes — with Jackson doing most of the talking. Trading Anthony does make sense for the Knicks. It’s hard to conceive of them building a team good enough to compete for a title within Anthony’s window, and at age 32, his trade value is still high and yet will never be higher. Jackson reportedly wants to start over and build around Kristaps Porzingis, but he needs to get a good return, and he needs to find a trading partner where Anthony would be willing to go. This mess was set in motion when Jackson okayed that no-trade clause three years ago, and sealed when he failed to build a good roster in the intervening years. Melo, at least, is playing his cards close to the vest. 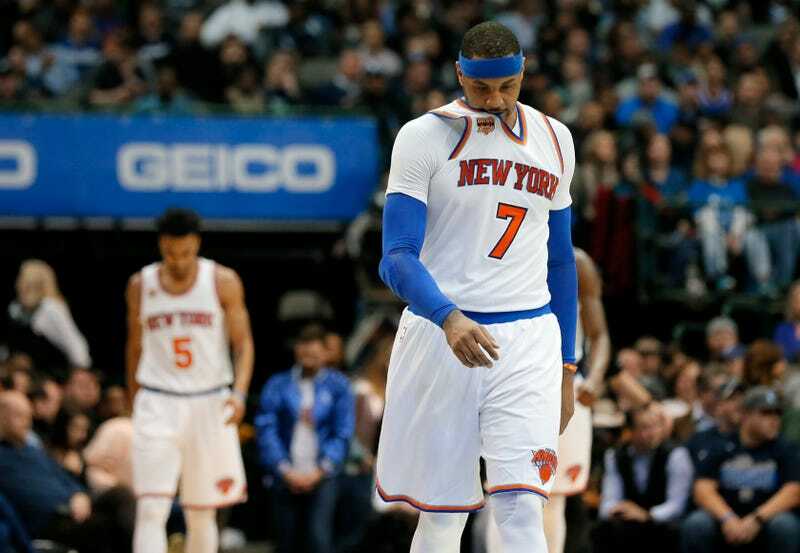 Oh, and the Knicks lost to the Mavericks last night.